Can I live here in this cute little gingerbread house? Everything in it’s tiny world is just so cute. And I’m pretty sure I could live off of the snow. 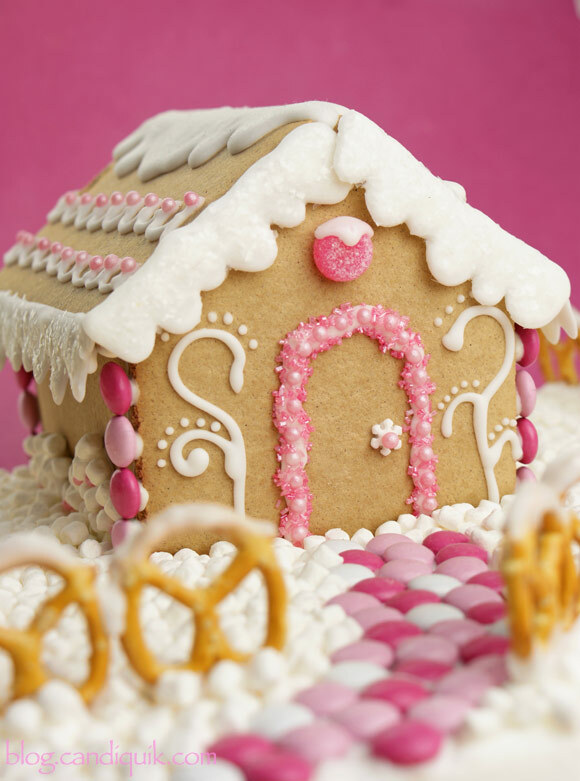 Forget using frosting for your gingerbread houses…overrated. Candy coating works much better (and faster). 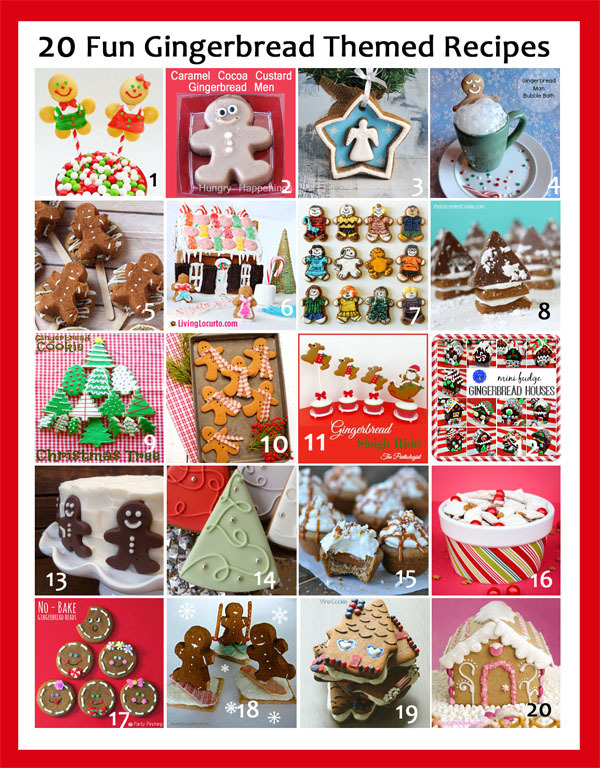 I would also like to take a poll…who actually eats their gingerbread houses? Many treats I will look at and say, “That’s too cute to eat”. And then I eat it. Well this, this is too cute to eat. Truly. Not even touchin’ it. If you didn’t want to use gingerbread, you could use graham crackers. But just be careful as they are much more fragile and susceptible to breaking. 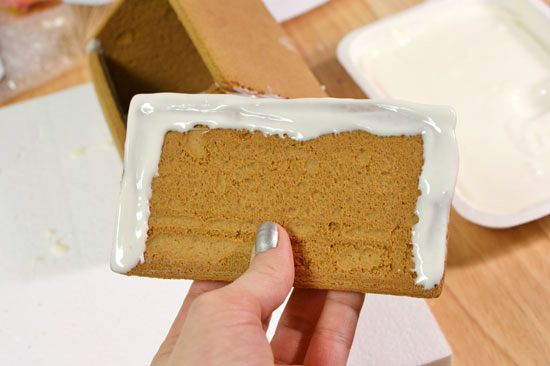 I used Vanilla Candiquik coating as the “glue” to build this entire gingerbread house. It worked like a dream. No waiting hour upon hour for your frosting to dry. I made this in one afternoon. The coating is also much easier to work with, especially for fine details. For the detailing on the gingerbread house, I poured the Candiquik into a plastic (freezer) ziploc bag and piped the designs on. 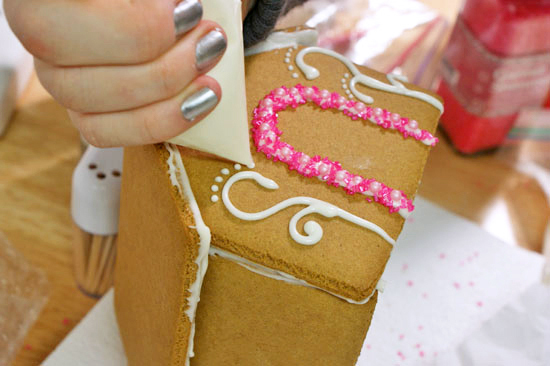 Assemble the house by first attaching the side walls of the house; spoon the candy coating on the side of one gingerbread and hold the adjacent gingerbread in place until it begins to set. 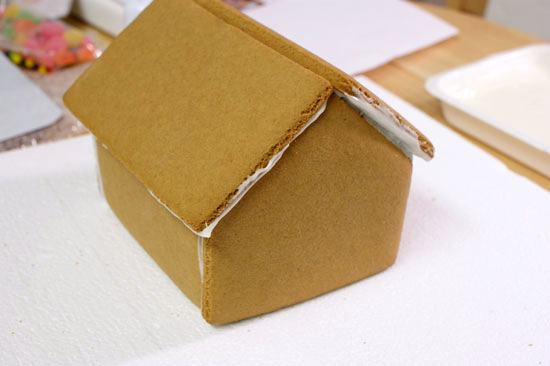 Once all four walls are attached, use the same method to attach the roof; let completely set. 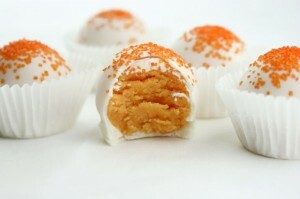 To decorate, transfer CANDIQUIK into a plastic Ziploc freezer bag (with a tiny hole cut in one corner) or a piping bag. 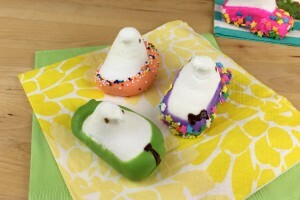 Pipe on designs and attach sprinkles using the candy coating. *For the snow trim on the house, pipe design onto wax paper, let dry and attach to the house trim with candy coating. *For a chimney, glue two caramels together using candy coating, then slice the bottom caramel in half at an angle and attach to house using another dab of candy coating. Pipe snow on top if desired. 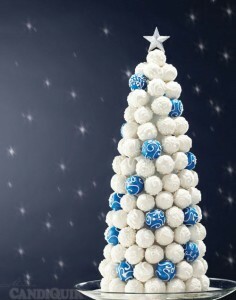 *Once the house is completely decorated, use a dab of candy coating to secure the house to your board. *To create the path, use candy coating to secure M&M's onto the board. *For the pretzel fence, pipe a dab of candy coating onto the board and place pretzel on top, holding in place until stable. Repeat, adding a dab of candy coating in between the pretzels to help secure. 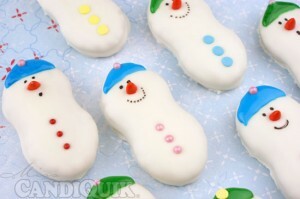 *For the snow, spread candy coating on the board and sprinkle with marshmallow bits. Wow! That’s a cute gingerbread house. 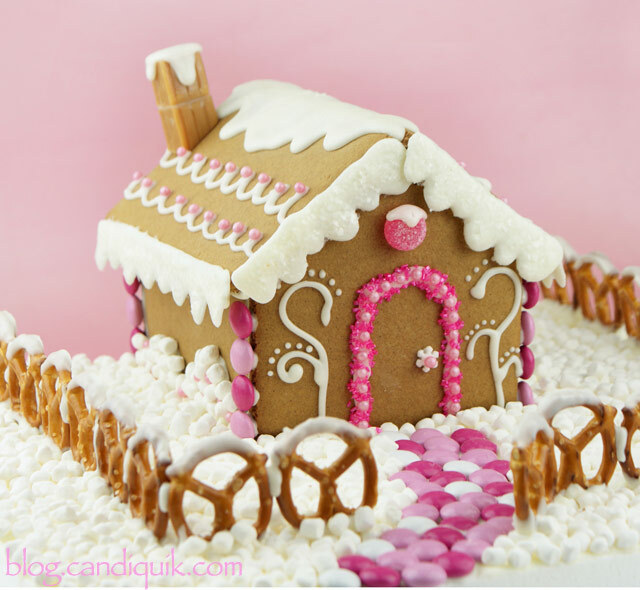 What a great idea to use Candiquik on the houses…we just did some with the kids the other day and of course they are always so impatient waiting for the frosting to dry. There were a few casualties:-) Your house is absolutely darling…I love it with the white background…it really “pops” out!!! Can you tell me which are the candiquick? is it like white chocolate? I don´t live in the states and sometimes I don´t know which are the correct ingredients. thanks for the post and for your replay. Hi there! Yes, Candiquik is the vanilla coating used to make this. 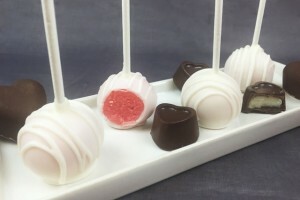 It is similar to white chocolate, only easier to melt and hardens nicely. Thanks for the comment :). Sarah, Your house is so darn cute, and I am in love with the PINK! oh it is just BEEEEUUUUUTEEEEEFFFUULLLLLL!!! ‘nuf said. Sarah, I could certainly live in this little house – that is if I didn’t eat it first! I love that you decorated it in pink! So pretty, love the pearls on the roof! Your house is lovely! 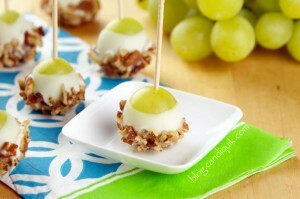 How genius is it to use the melted candy as the “glue”?! Love it. It was MUCH easier, haha. Thanks, Karen! Too cute!! I want to live there too! 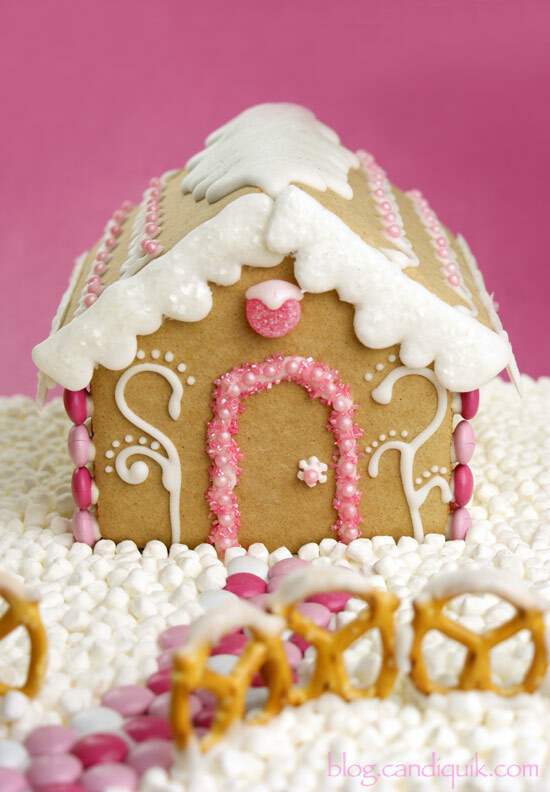 What an adorable gingerbread house! I only ever made one – a bunch of us got together and made them from scratch. It was wonderful and I didn’t plan to eat it, but someone knocked it off a table, so …. 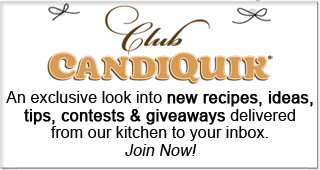 The candiquik is a great tip. So many uses for that stuff! Sarah, this is so cute!! 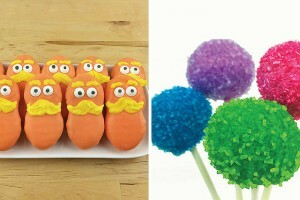 I always use royal icing but after reading this post I’m inspired to use candy coating next time–easier, quicker, and tastier! Omg this house is soooo cute I love the pink. Can you pleeeeeeaaase tell me the dimensions/measurements for the pieces of the house! 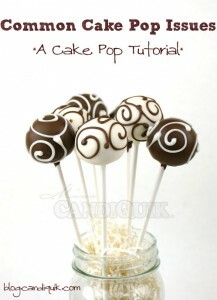 I really want to make this for school.